I’m a huge fan of tools that increase my productivity and creativity. (I’ve previously talked about some of my favorite productivity tools and how I use lists.) But, for me, calendars might be the best genre of tools I have to keep me on track and to keep my ideas for new and future projects organized. Look ahead. I set deadlines in the future and then work backward to finish large projects. Balance projects. I can see when certain projects are ending and others can begin. Set monthly limits. I try not to travel more than once per month, for example. Track my goal progress. I can see whether I’m keeping up daily goal streaks and/or how much time I have left to meet monthly or annual goals. Keep track of ideas. By taking note of ideas directly in my calendar, I can see how long it takes me to act on them. For my daily tasks and to-do lists, I use the Get to Work Book weekly planner. What I love the most about this tool is that it’s dated, but not time-stamped, so I can use it to make daily lists of the things I need to get done and track my progress on a range of different projects down to the tiniest detail. I also use the daily goal tracker from the same small business owner that created the Get to Work Book. I use this tracker to mark progress on my New Year’s Resolutions to drink more water, eat more greens, and walk 10,000 steps per day. So far, I haven’t missed a day for any of these 2017 goals. To track my release schedules for my podcasts and for keeping track of my weekly essay topics, I’m using Austin Kleon’s monthly calendar. It has a simple design where I can write in the topics for various upcoming episodes and essays and then mark them as completed when they’ve been recorded or drafted. This tool also helps me to schedule out various future topics and jot down ideas of what I might record or draft in the weeks to come. Of course, Kleon’s art for each month is also incredibly inspiring, but I deconstructed this calendar so that I could arrange it on a wall or table and look at multiple months at a time. Once I’ve worked my way through the year, I’ll decide what to do with the art pieces on the back of each month. To keep track of my travel obligations, I’m using a wall calendar that’s similar to this one from Neu’s calendars. Because I travel for several days at a time and sometimes have back-to-back trips, this larger calendar can let me see how busy a particular travel period will be at-a-glance. I also mark publishing deadlines on this calendar as well so that I know how my travel schedule might impact my writing time. This calendar is posted on the wall of my office at my day-job since that’s the place I book most of my travel. To keep track of more personal items like family birthdays and other special events, I use a shared Google Calendar with my partner. We both get reminders of upcoming birthdays via email and can decide who is going to buy and send the gift (usually this is something I delegate because my partner happens to be an excellent gift picker-outer). 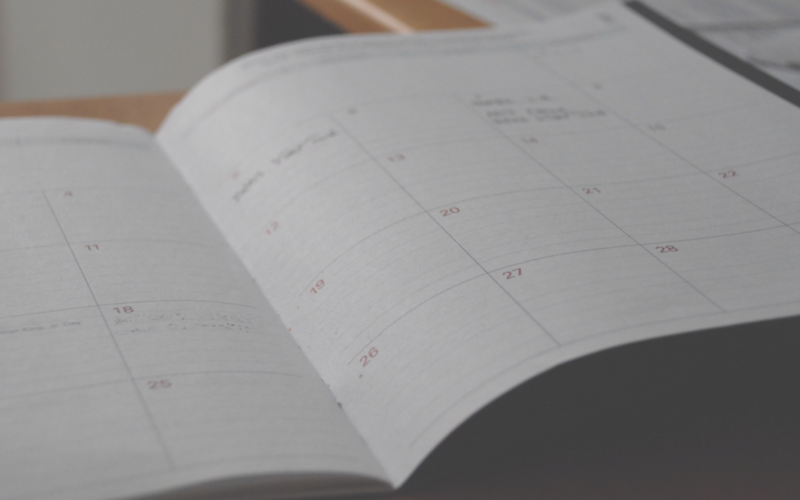 Until recently, I was using the Need to Meet appointment calendar to schedule consults for my side business, but I recently switched to Acuity Scheduling and have been experimenting with the range of features there. I don’t have a paid account (yet), but I imagine I may invest in one in the future so that I can take advantage of the email and text message reminder features and the time zone translation. And, of course, for my daily schedule of events, I use the iOS calendar app that syncs with Outlook. It’s not perfect, but it’s pretty good for making sure I get where I’m supposed to be throughout the day. My co-workers are also Outlook power users, so it’s a great tool to schedule meetings with other people and to share my availability. I also use this calendar to remind myself when I need to check in for flights, when I need to send important emails, and when I need to upload podcast episodes and post on social media. This may seem like a lot of tools, but I’ve found that setting up systems for various processes is what works best to keep me productive and creative. When I’m juggling lots of projects, ideas, and deadlines, the worst thing that can happen is that I might forget something. Each of these systems ensures that I don’t miss meetings, that I can collect all my ideas in places where I can find them later, and that I know what’s coming up for me that might impact the work I can do in the immediate future. As someone who loves to plan, calendars are essential to my peace of mind. What systems have you set up for your productivity and creativity? What calendaring tools are your go-t0 favorites? What else should I be checking out?